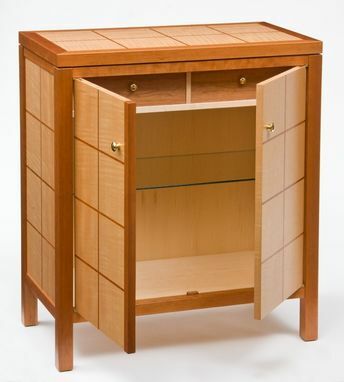 This cabinet was designed and built afer I completed a long series of complex curved work. My intention was to design a small cabinet using only straight lines and planes. 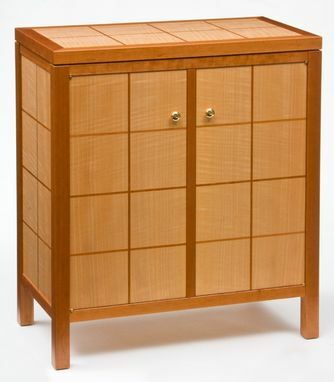 There is a pattern of Cherry inlays in the panels that break up the large surfaces and also give the cabinet a slightly Japanese appearance; something akin to a simplified Shoji style screen appears in the door panels. The interior is veneered in Maple for contrast with the Anigre and Cherry exterior and there are two Cherry and Maple drawers lined with silvercloth behind the doors. 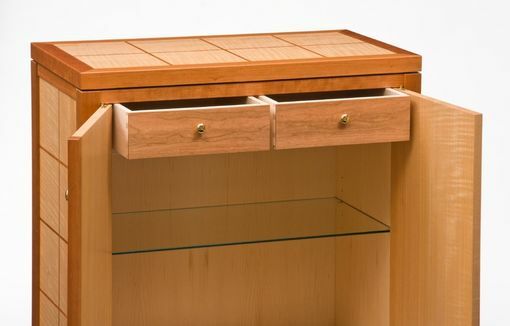 The entire cabinet is finished with satin Lacquer and it has solid brass handles and one adjustable glass shelf inside.